The prevalence of slavery in pre-Revolutionary America made actual and threatened slave uprisings of intense interest throughout the British colonies in North America. The West Indies, or Caribbean islands, where slavery predominated, were vitally important to commerce and trade in the colonies, and slave revolts there were particularly newsworthy. 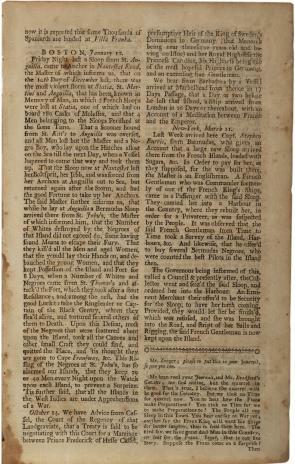 In this issue of the New-York Weekly Journal, dated March 11, 1733[/4],* editor John Peter Zenger printed a sloop captain’s report on a slave takeover of the Danish island of St. John in November 1733. A group of slaves, the captain reported, “kill’d all the Men and aged Women, that they could lay their Hands on, and debauched the young Women, and that they kept Possession of the Island and Fort for 8 Days.” He also claimed that the revolt had been put down after “a number of Whites and Negroes from St. Thomas’s . . . attack’d the Fort, which they took after a stout Resistance.” However, fighting continued on St. John until 1734, when English and French forces ended the uprising. * Zenger mistakenly continued to print 1733 on his masthead after the year changed. He began printing the newspaper in November 1733. A transcript of the excerpt is available. Friday Night last a Sloop from St. Anguilla, came to Anchor in Nantasket Road, the Master of which informs us, that on the 10th Day of December last, there was the most violent storm at Statia, St. Martins and Anguilla, that has been known in Memory of Man. . . . The said Master further informs us, that while he lay at Anguilla a Bermudas Sloop arrived there from St. John’s, the Master of which informed him, that the Number of Whites destroyed by the Negroes of that Island did not exceed 60, some having found Means to escape their Fury. That they kill’d all the Men and aged Women, that they could lay their Hands on, and debauched the young Women, and that they kept Possession of the Island and Fort for 8 Days, when a Number of Whites and Negroes came from St. Thomas’s and attack’d the Fort, which they took after a stout Resistance; and among the rest, had the good Luck to take the Ringleader or Captain of the Black Gentry, whom they flea’d alive, and tortured several others of them to Death. Upon this Defeat, most of the Negroes that were scattered about upon the Island, took all the Canoes and other small Craft they could find, and quitted the Place, and ’tis thought they are gone to Cape Fransway, &c. This Rising of the Negroes at St. John’s, has so alarmed our Islands, that they keep 30 or 40 Men every Night upon the Watch upon each Island, to prevent a Surprize. ’Tis further said, that all the Islands in the West Indies are under Apprehensions of a War. . . .